Clos Windsbuhl is located relatively high, at 300-350 m and has a cool microclimate. The bloom is usually two weeks later than at, say, Grand Cru Brand in Colmar. This year, however, spring came early and the grapes were allowed sit a long as 120 days on the vines. Perhaps it is the explanation for wine's amazing complexity. 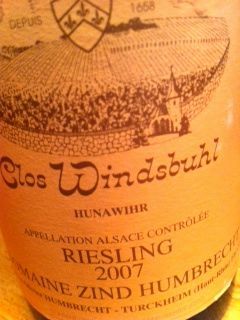 2007 Riesling Clos Windsbuhl from Zind-Humbrecht in Turckheim has golden yellow, dense color. The nose is tight and clean with flint, coriander, dates and chocolate. The taste is very dry, crisp with a steel-like, clean acidity and plenty of minerality and grapefruit peel in the long finish. 13.1% alcohol, a mere 1.4 grams of residual sugar per liter. Price: € 60. That low residual sugar is a surprise to me. Doesn't Zind-Humbrecht, with their "generous" style, generally use more residual sugar? Then again, in 2007 the acidity could be a bit on the low side. Hence the low sugar levels to get the balance, I take it. Clos Windsbuhl never generates a lot of sugar, as I understand it. Personally I think the "generousity" of Z-H is carried by dense fruit rather than sugar. Regarding the 2007 I think they have outstanding balance. They are very complete and now start to show some signs of maturity. The very acidic – but great – 2008 will take many more years to show their potential.